Commander (2018 Edition)decks come out August 10! The most fun one can have with a Commander (2018 Edition) deck, outside of playing games with it, is customizing and making it your own. 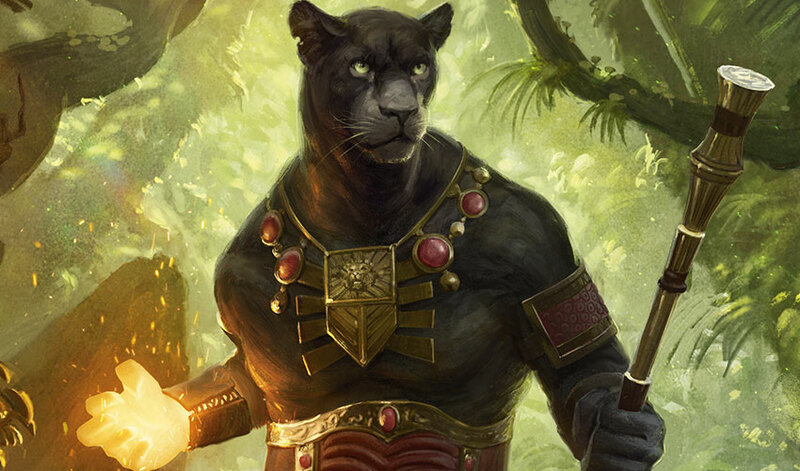 For Commander (2017 Edition), I laid out a general approach for customizing Commander decks using "Feline Ferocity" as the focus. This year, I want to refine this focus for "Nature's Vengeance," a decklist starring the card I discussed a few weeks ago, Windgrace's Judgment. Instead of looking at multiple commanders you can use with the decklist, I want to examine the multiple ways we can support the "star" of the preconstructed deck, Lord Windgrace. "One of Jund's [the color combination of black-red-green] problems—and a problem with land-heavy decks in general—is they can run behind on cards and things to do. With Lord Windgrace, you can always turn your excess lands into more cards . . . and still stay ahead on mana due to the combination of abilities!" We know that "land matters" to Lord Windgrace. What are the implications of his abilities? His +2 ability can, as Gavin says, help you cycle through your deck or turn lands into card advantage while setting up for his -3. The ability also implicitly supports graveyard strategies. You can pitch cards to turn on mechanics like threshold or delirium. The ability also can support reanimation subthemes, whether you are bringing back creatures or lands. Lord Windgrace's -3 ability sets you two turns ahead on mana, but it also acts as a graveyard tutor. Another way to read this card is "get any two utility or combo lands from your graveyard." The more cards you get in the graveyard, the wider a selection you have. The -3 ability also triples the per-turn activation of land-based triggers from mechanics like landfall. Where normally you only get one such trigger a turn, you can now receive three when using this ability. Lord Windgrace's ultimate isn't "lands matter"; it is a wrecking ball, pure and simple. The ability also combines thematically and mechanically with Windgrace's Judgment. It is a solid ability, but since the interplay between his +2 and -3 abilities is so strong, you might not often get to using it. Graveyard: Dump cards in graveyards to reanimate or trigger graveyard abilities. Example supporting cards: Soul of Innistrad; Centaur Vinecrasher; Gyrus, Waker of Corpses; Grisly Salvage; Stitch Together; and Far Wanderings. Land Bonus: Payoff for playing multiple lands in a turn, payoffs for having high land count. Example supporting cards: Rampaging Baloths, Rubblehulk, Crash of Rhino Beetles, Zendikar Incarnate, and Avenger of Zendikar. Ramp: Increase mana count and cast big overwhelming spells with it. Example supporting cards: Harrow, Explosive Vegetation, Explore, Cultivate, and Farhaven Elf. Destruction: Blow up any permanent type in the game. Example supporting cards: Putrefy, Chain Reaction, Windgrace's Judgment, Consign to Dust, and Savage Twister. Breaking out what Lord Windgrace leads us toward and how Nature's Vengeance supports that currently provides the grounds for us to then start updating the deck. By narrowing our focus on one or two themes and devoting more cards to it, we can make our version of the preconstructed deck uniquely ours. Bolstering a theme gives us an opportunity to highlight a specific part of the decklist by doing more of it. The simple act of removing ten to fifteen cards that don't support the theme we choose and replacing it with 10-15 that do can make a huge difference to how a deck plays and feels. After playing a few matches, we can then decide if we want to go further down that road or choose a different focus. We are looking here for cards that let us utilize our natural discard abilities to select, recur, and "cheat" out spells (through reanimation). Land "reanimation" lets us bring our lands from the graveyard into play. Crucible of Worlds synergizes naturally with Lord Windgrace, as you can discard a land to draw two cards and then play the land you discarded. Crucible of Worlds also makes great use of fetch lands like Rocky Tarpit, Mountain Valley, Wooded Foothills, Bloodstained Mire; you can keep reusing the fetches to pull lands out of your deck. Splendid Reclamation and The Mending of Dominaria both offer potentially explosive increases in your mana. Creature reanimation spells (Reanimate, Exhume, Animate Dead) can help us cheat out big creatures that we pitch with Lord Windgrace. Sagas like The Mending of Dominaria and The Eldest Reborn help you put creatures and lands into play. Windgrace also needs support getting cards into the graveyard. He gets help with cards like Gamble, Faithless Looting, Tormenting Voice, Cathartic Reunion, and Entomb. We want cards that pay attention to when lands come into play, and how many lands we have. Multani, Yavimaya's Avatar is a recent card that slots so well in this theme. Multani is hard to keep off the board and can get gross quickly. Multani is not alone, however: there are a host of legendary permanents like Omnath, Locus of Rage; Molimo, Maro-Sorcerer; Ob Nixilis, the Fallen; and Blackblade Reforged that key off high land counts or playing land. "Nature's Vengeance" includes Retreat to Hagra already, and it is worth looking at its companions Retreat to Valakut and Retreat to Kazandu as well. You can use cards like Ghirapur Orrery, Exploration, Scapeshift, and the previously mentioned Splendid Reclamation to enable extra playing land triggers. Another payoff for having lots of lands is simply using them to attack with. Rude Awakening, Sylvan Awakening, Natural Affinity, and Life // Death all turn your lands into hard-hitting weapons to take out your foes. "Nature's Vengeance" includes some conventional ramp spells. You can include even more to help it cast Lord Windgrace and move on to bigger spells. If you keep the ramp land-based instead of creature-based, it will combine very well with a land-bonus theme. Hour of Promise and Grow from the Ashes both provide you an extra bump in land. Hour of Promise gives you some extra Zombies if you put some Deserts in your deck, but it also lets you get any land that you want, if you wanted to get something like a Maze of Ith for early defense or a Dark Depths for a combo with Vampire Hexmage. Grow from the Ashes is more limited, but when you put the lands into play, they don't come into play tapped, giving you potential to cast extra spells immediately. You will want cheaper ramp spells to get you to that five mana earlier though. Rampant Growth and Farseek can certainly fill that role. Destruction is not a major theme in "Nature's Vengeance." There is just enough removal to sweep the board a few times or to disrupt troublesome combos. By increasing the amount of spot removal and sweepers, we expand our ability to control the pace of the game. Just don't make too many enemies in the process of blowing everything up! Sweepers like Jokulhaups, Damnation, and Back to Nature give us useful board control on all our opponents. In combination with graveyard themes, we might be able to break symmetry on these sweepers and recover way before them. Spot removal will also have its uses, though we don't want to rely on it heavily in our multiplayer games. Still, sometimes you just want one thing gone. Cards like Hero's Downfall, Terminate, and Beast Within are very useful for "precision" destruction. Adding cards to expand one of these themes is just a start. We've already discussed how some themes naturally complement other themes, and you should look and see which two or three themes you want to make the focus of your deck. Maybe you want to combine land bonus and graveyard themes to fill up your graveyard and cause a sudden explosion of land to create an overwhelming set of land triggers. Or perhaps you want to use ramp and land bonus themes to play the hugest threats and X-spells you possibly can. Whatever themes you focus on and blend together, there are many ways to customize "Nature's Vengeance" without even changing the commander. What kind of Lord Windgrace will you be?